The bur oak (Quercus macrocarpa) is a common species associated with the oak savanna landscape. This species is also known to “invade” prairies, where it can, under appropriate conditions, become established. Bur oaks and prairies thus “go together”. Fire is an important element in controlling the relationship between oak savannas and prairies. The bur oak is the most fire-resistant of the oaks. 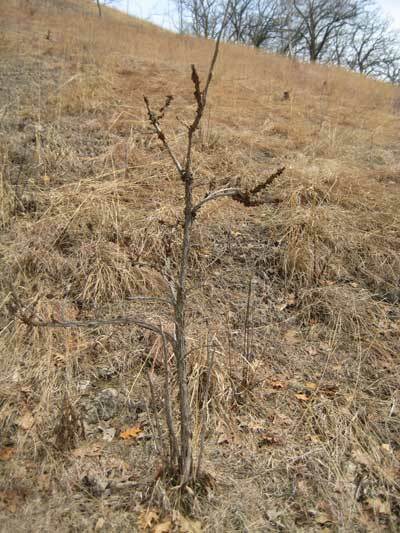 Even fairly small bur oak trees produce a fire-resistant, corky, bark. Depending on the intensity, such “grubs” can often “escape” fire. Once they get large enough, their fire resistance is so great that they can even tolerate relatively intense fires. At Pleasant Valley Conservancy, the south-facing slope provides an interesting habitat for observing prairie/bur oak relationships. 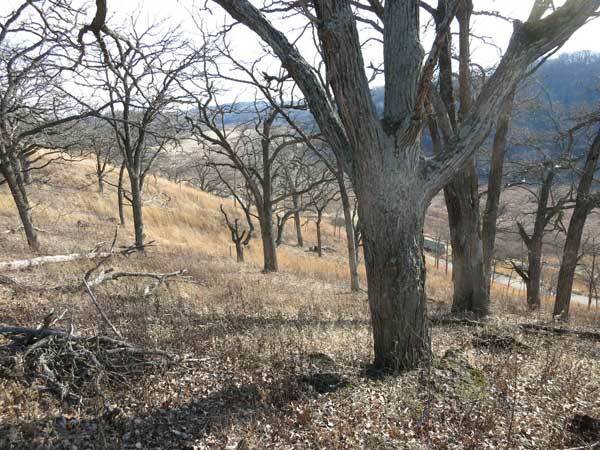 The upper part of the slope is an extensive bur oak savanna with many mature trees that have survived numerous fires during their lengthy existence. 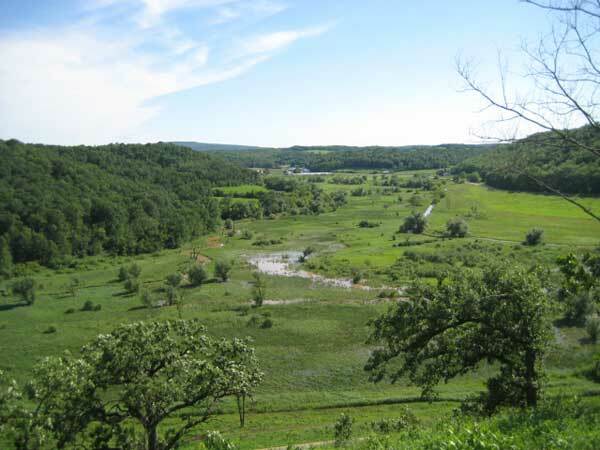 The lower slope is primarily tallgrass prairie, but is continually being “inoculated” from above by bur oak acorns. 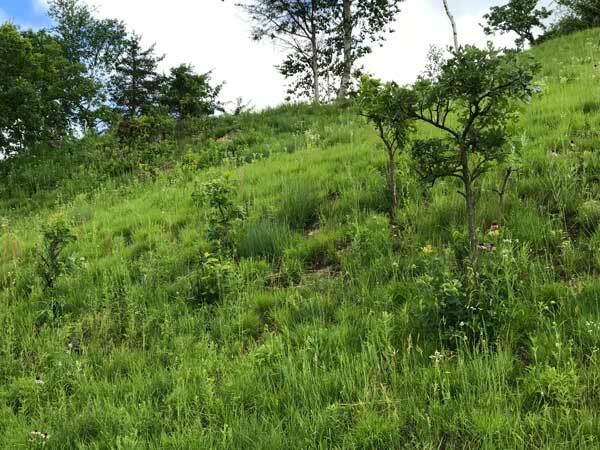 When we first started restoration work at PVC, the south slope was quite wooded, with invasive shrubs and trees, including pines and red cedars. The prairie patches were small and scattered. After the slope was cleared of woody vegetation, the first burns we carried out were very poor. There was insufficient fuel to carry a fire, so we had to “force” it to burn by extensive use of the drip torch. Although the bur oaks were being heavily crowded by the invasive woody plants, they were still able to function because their canopies were above everything else. And because of the unsatisfactory fuel, flame heights were low and had little effect on the oaks. In order to bring this ecosystem back to its full potential, beginning in 1998 we initiated a program of annual burning. For the first few years, with the poor fuel, burns were unsatisfactory, and we had to use headfires, lighting at the bottom of the hill and hoping the flames would carry to the top. Gradually, the burns got better. It was in 2003 that the headfire, lighted at the bottom, carried to the top of the hill. (Because of the steep slope, a fire lighted from the bottom of the hill acts as a headfire even is there is no wind.) 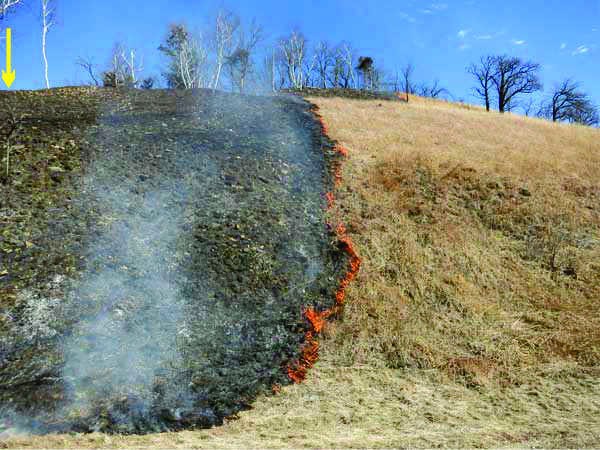 Since 2006 we have only burned the south slope as a backing or flank fire, starting at the top. A bur oak grub seen in 2010. The large bur oaks have thrived on our annual burn schedule, and every few years make a large crop of acorns. Some of these acorns make it downhill to the “pure” prairie on the lower part of the slope, germinate, and form bur oak seedlings, often called "grubs". It was in 2010 that these seedlings were large enough to notice during a casual survey. This year (2017, see photo below) I discovered that some of these bur oaks have gotten out of the grub stage, perhaps for the first time, and their bark is now thick enough that the stems were not killed by the fire. I counted six bur oaks large enough to perhaps survive our annual burns. Six small oak trees, at least two of which are out of the "grub" stage. These are just at the top of the steep Pleasant Valley Road hill cut. The tree on the right is also seen in the fire photo below. As it happened, I got a photo of the burn moving across this area. The yellow arrow on the photo points to the largest bur oak. Low intensity fire moving across the south slope. The yellow arrow shows the location of the tree seen in the above photo. We already have examples of this further along the south slope, where there are scattered small bur oak “trees”. Walk along Pleasant Valley Road and take a look. Restoration work on the Pleasant Valley Conservancy wetland has been underway for over 15 years. This work has been carried out by Craig Annen and his company, Integrated Restorations (IR). Recently, as part of a survey for hybrid cattails, Craig has prepared a detailed summary of the wetland, including an extensive species list which includes a Floristic Quality Index (FQI). Craig's paper has now been posted on the PVC website and is available for download. According to the report, the 35-acre complex is a mosaic of seven unique wetland types: riparian floodplain, emergent aquatic, open water, shrub-carr, peaty sedge meadow, wet prairie, and calcareous fen/spring. 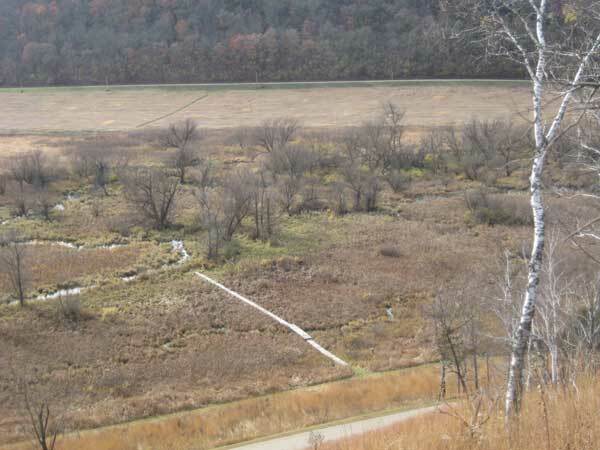 View of the PVC wetland from the bench at the Far Overlook. Although there is a substantial stream running through the wetland, most of the water is from springs and seeps. Early Autumn view of the wetland, showing the location of the boardwalk. The wetland complex supports 163 indigenous species of native plants, all listed in the report. The Floristic Quality Index (FQI) has a value of 62.2, indicative of a remnant natural area of remarkable quality. Thirty-eight species have a coefficient of conservatism (C-value) greater than or equal to 7, and 16 species have a C value greater than or equal to 8. These values are indicative of remnants of high-quality and with the least amount disturbance. Thus PVC has been justified in placing high priority on its wetland restoration work. 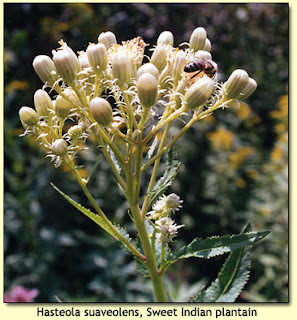 One plant species, sweet Indian plantain (Hasteola suaveolens), is a species of Special Concern in Wisconsin. A gallery of flower photos and further information on the wetland can be found on the wetlands page on the PVC website. We have been burning oak savannas and oak woodlands at Pleasant Valley Conservancy for 20 years. In the early years we made lots of mistakes, as there were no sources of good information on the use of fire. (The Internet was still in its early stages.) As the years have gone by, our mistakes have been less and the sizes of our burns have been bigger. In 2015 I was asked to give a presentation on "Fire management in oak savannas" at the annual meeting of the Prairie Enthusiasts, which prompted me to assemble photos and data for a Power Point presentation. I finally found time this past winter/early spring to convert that presentation into a PDF, which is provided in this link. "Oak savannas are fire dependent communities. Fire management in oak savannas differs from that of prairies or oak woodlands. 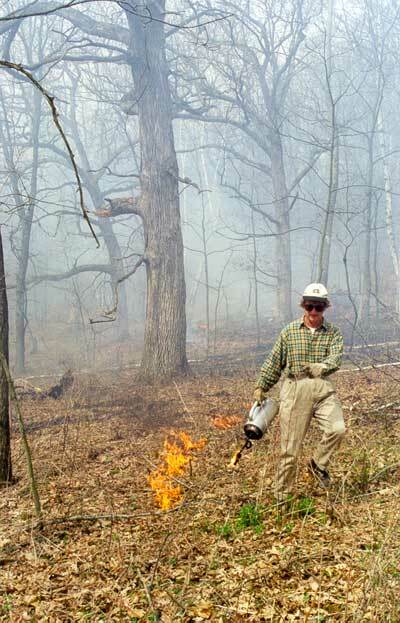 This document provides details on how to conduct an oak savanna burn. 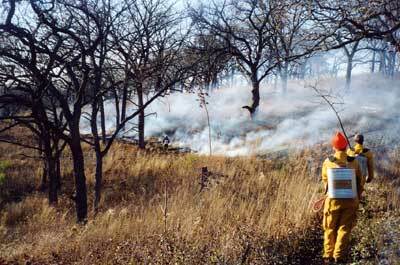 Fire is especially important in oak savanna restoration. 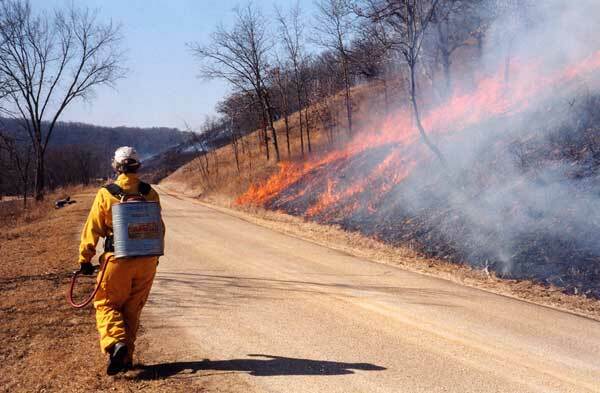 An oak savanna restoration project should not be initiated if fire is not an option. Ideally, fire should be used annually for at least 10 years. After 10 years, fire can continue to be used annually, but should be used at least two out of every three years indefinitely." and to get good burn coverage the burn was run as a headfire. The second photo shows the first burn we did in the ridge-top savanna (Unit 12B/11B). At that time, although there was good fuel (oak leaves), the fire did not carry well because of all the downed timber and coarse woody debris. Here Kathie is doing extensive interior lighting (stripping), literally "forcing" the savanna to burn. As the years went by, the savannas burned more readily and did not need so much work to burn. The tutorial goes into details on the savanna burn process.